Uh-oh, someone has joined the dark forces! Previously on The Four… catch up with episode 35 recap! After ASG recommends Ji Yao Hua as interim leader of Shen Hou Fu, Zhu Ge receives a letter confirming it all. He promptly announces this to everyone’s surprise. Though Ji Yao Hua fakes humility, she is clearly more than pleased with it all. How can someone turn evil so quickly? Sigh. Once folks turn away, Ji Yao Hua immediately reports to ASG for duty. She hands over a special key that unlocks Zhu Ge’s cabinet which stores all the documents on different criminals known to them. ASG compliments her and returns the key to her for safe keeping. He also plays with her hair (and smells it) as he reminds her of their deal – helping her seek revenge on Leng Xue in return for her assistance now. Ji Yao Hua is officially the leader now! Thinking that she is on their side, Wu Qing, Zhui Ming and Tie Shou request to be in charge of the coin case, but she disapproves, saying that they are too close to Zhu Ge and might cause more issues. Of course, this is not the real reason. She gives the case to Hai Tang and Hu Die, the two annoying female detectives, saying they need the practice. Lame excuse! Zhui Ming and Wu Qing bring this information to Zhu Ge who is surprised as well, but is still convinced that Ji Yao Hua must have her reasons. Zhui Ming is unsure of this because it really doesn’t make much sense at all and plus both he and Wu Qing think Ji Yao Hua changed quite a bit since her return. Zhu Ge continues to reassure them that Ji Yao Hua is able to handle it all and they should just obey her especially since she is one of them. Hmmmm don’t be so sure of that dude! Zhui Ming, Wu Qing and Tie Shou gather at the restaurant to decipher Ji Yao Hua’s meaning. Tie Shou thinks that Ji Yao Hua is trying to protect herself, afraid that sending them three will only create problems with Six Doors and indirectly cause her to lose her seat. Zhui Ming adds that he seriously dislikes people who have no courage and no brain (LOL), but Wu Qing comments that it would only benefit Ji Yao Hua to send them. Why is that? Well, if they solve the case, then she will surely gain compliments from the higher ups, securing her position as the leader of Shen Hou Fu. Therefore, they conclude that it is likely that she has an ulterior motive! The three set out to investigate Ji Yao Hua. First, Tie Shou pretends to search for information in the cabinets, causing Ji Yao Hua to scold him severely, warning him to never do it again. It’s not all an act though because Tie Shou does find there are a couple of criminal records missing. At the same time Zhui Ming overhears the two female detectives talk about how Ji Yao Hua have not used her medicine in a while and yet she still seems to be healthy. It’s because she has the magic m&m!! Wu Qing also follows her out of Shen Hou Fu, but he gets caught… FAIL. Well, at least he knows she is on high alert! Meanwhile, Yu Chun Tong raids some random place that is making fake coins and the guy they caught claims Prince Zhu is the one in charge. ASG brings this news to uncle and provides a handwritten letter by Prince Zhu that seems to prove all of this to be true. Uncle doesn’t understand why Prince Zhu would do something like this because he already has all the wealth he could want. 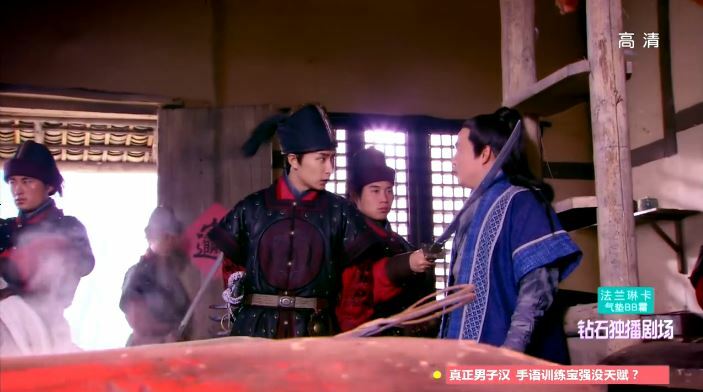 ASG pushes things a bit further and uncle concludes that Prince Zhu and Zhu Ge must be planning a rebellion together! Armed with the permission of uncle, ASG leads Six Doors to arrest Prince Zhu. ASG shows Prince Zhu the stamped letter, but Prince Zhu finds that he lost his royal stamp! ASG claims that the stamp is lost at too convenient a time, implying that the Prince is lying. Chun Tong calls up the guy they caught and the guy is all like save me prince, save me! Before the guy can say anything else, an archer hidden up on the roof shoots an arrow and kills him! Haven’t had enough? Click for episode 37 recap!